John Muir an author, environmental philosopher and early advocate of preservation of wilderness in the United States, said that the clearest way into the universe is through a forest wilderness. And I am sure most of you will agree with him. But you’ll also agree with the fact that we are losing that way, that too at a very fast rate. In India the total forest and tree cover area is 79.42 million hectare, which is 24.16 percent of the total geographical area as per the report of India State of Forest Report (ISFR). But, the rate of degradation of these forests is quite alarming and forest fires are playing a major role in that. According to a report of the Forest Protection Division, of the Ministry of Environment, Forests and Climate Change (MoEF), 3.73 million hectares of forests are affected by fires, annually in India. The normal fire season in India is from the month of February to mid June or August. And perhaps, the most limiting factor in controlling these fires is the inability to detect them during initial stages and take rapid action. This is especially true for fires in areas with limited access. But being the most intelligent beings on this earth, we humans, have a found out a solution to that problem too. The solution is Remote Sensing. How is it going to help in detecting forest fire? Remote sensing can support many aspects of fire management. It is commonly involved in the processing and analyzing images captured with sensors on aircraft or satellite. Once the images are obtained, they are used for pre-fire assessment, during-fire assessment, and post-fire analysis. Pre-fire assessment involves thorough study of the forest area prone to forest. The maps of fire fuel type, fire fuel properties and topography are prepared for proper assessment. Fire fuels maps have information about combination of vegetation type and characteristics that may represent various fuel components (e.g., leaves, stems, litter, etc.) associated with different types and ages of vegetation. During-Fire assessment involves real-time mapping of the fire extent and movement. Maps of fire temperature at various stages of a wildfire are useful for assessing the severity of the fire and the nature of soil and vegetation recovery. Post-fire analysis includes the analysis of extent and the severity of the burn, in order to plan for recovery. High spatial resolution images are useful for general post-fire examination of structural damage. Moderate resolution images from visible and infrared sensors on polar orbiting satellites or high altitude aircraft are used for immediate mapping of fire affected area. Due to lack of timely information on forest fire occurrence, effective forest fire control measures become difficult in India. Near real time monitoring to detect forest fire has now become possible due to availability of few satellites in recent past. MODIS (Moderate Resolution Imaging Spectro-radiometer) – a collaboration between NASA and University of Maryland, USA, is one such satellite system which detects active forest fires. Forest Survey of India (FSI), since November 2004, has taken the initiative in active forest fire detection. FSI uses spatial information available on a website –the Web Fire Mapper, which displays active fire locations based on MODIS Rapid Response System. The coordinates of active forest fire locations from these sites are projected on the forest cover map of India to select active fire locations within forest cover. Locations not inside the forest cover are eliminated and then the information is disseminated through fax/e-mail to the concerned State Forest Department for confirmation as well as remedial measures. During the April 2016 event, forest fires were widespread, both in Uttarakhand and Himachal Pradesh region, covering most of the forested regions of the state and the number of fires observed was unusually high. These fires were set mainly in pine forests in the slope of the sub-Himalayan region. Here are satellite observations on the event. First figure shows the spatial distribution of active forest fire detections during 24 April–4 May 2016 in Uttarakhand and the second one shows the temporal occurrence of forest fires during the same period. Spatial distribution of cumulative forest fire locations in Uttarakhand, India during the 24 April-2 May 2016 fires. Temporal distribution of the same fires. 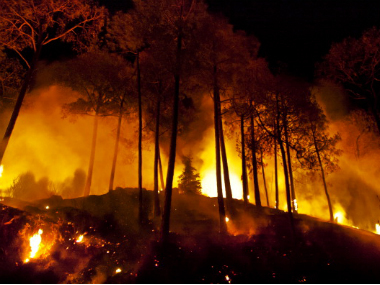 A total of ~1600 active forest fire detections were seen in Uttarakhand during the period. As per the data available, fire activity started on 24 April 2016, peaked during 26–28 April 2016 and subsequently subsided. The vigorous attempts to contain and control the fires by the State Forest Department and the State administration were aided by rain and persistent cloud and by 2 May 2016 the heightened forest fire activity subsided. Study of fire prone areas, detection of forest fire and knowledge of extent of damage in real-time has become possible because of remote sensing. Remote sensing, of course, has a wide range of applications. Its use in forest fire management, however, has been a huge leap forward in our understanding and management of this natural phenomena. Could it be more amazing? PreviousLive and let live, or live and let die?